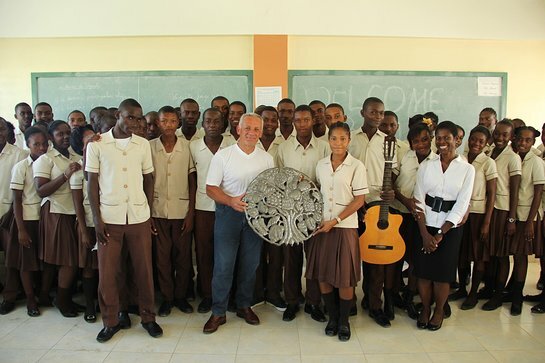 Artists for Peace and Justice (APJ), an organization whose mission is to alleviate poverty around the world, with immediate efforts serving the poorest communities in Haiti, wishes to pay thanks to strategic partner BOVET 1822, Swiss Manufacturer of luxury timepieces, for their six-year contribution of over $5 Million. Thanks to BOVET 1822 and the visionary guidance of Owner Mr. Pascal Raffy, APJ has been able to give 100% of every dollar towards meeting the organization’s mission, and has raised over $31M to support programs in education and training in creative industries. In a world of immense beauty, talent and abundance Mr. Raffy and his house of BOVET embody the very meaning of craft at its highest calling and excellence. Every part of a BOVET timepiece is meticulously hand crafted – and often hand painted as hand engraved – by master artisans at the BOVET castle and manufacture, both nested in the Jura Mountains, cradle of Swiss high watchmaking. Through its strategic partnership, BOVET 1822 has given APJ the platform to host star-studded fundraising events across the globe, including during the Toronto International Film Festival, with a gala event that most recently raised $1.4M. BOVET 1822 has also served as title sponsor for marquee events during the Oscars in Los Angeles, in addition to events in New York, London and Dubai. Notable names who have attended BOVET-hosted events include APJ Co-Chairs Ben Stiller and Susan Sarandon, as well as Sean Penn, Dame Helen Mirren, Adam Sandler, Olivia Wilde, Jason Sudeikis, Adrien Brody, Daniel Craig, Jackson Browne, Cuba Gooding Jr., Kevin Jonas, Chuck Close, Donna Karan and many, many more.